Customers of a video store in The Annex have five weeks to leaf through the aisles and search for their favourite films before the business closes its doors for good. Owner Howard Levman and his wife Penni Levman opened Queen Video 38 years ago and plan to go out of business at the end of April. For the next five weeks they hope to sell as many of the 30,000 titles that line their shelves as they can. “The customers spend a lot of time in here, they love talking to us, they're like our friends,” Howard Levman said. Penni Levman said the store holds a lot of personal history for the couple. “We started in 1981. Howie was 25, I was younger, I was 24. And we got married at this store. We had children. Our children got married and now we have grandchildren,” she said. Queen Video once had four locations in the city. The storefront at 480 Bloor Street West, near Bathurst Street, is the last one to close. The video store has made their name by stocking obscure titles that can’t be found on other platforms, which made them a staple within the community. Customers can be seen walking up and down the aisles of the store on Thursday, carrying lists of films they want to find before the business closes. “We’re actually talking about, not losing a store or a business, we’re talking about losing a library of film history,” Steve Smith said. Howard Levman said that the next month is going to be cathartic. “We had a few people crying yesterday and I’m sure they’re going to cry today too,” he said. Queen Video will officially close its doors on April 28. 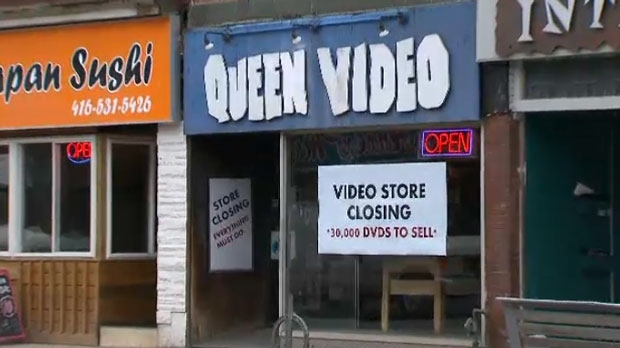 Queen Video, located near Bloor and Bathurst Street, will be closing its doors on April 28.